The 13.3-inch Toshiba Excite sports a high-res display, whichat 1,600 by 900 pixels is sharper than typical Android tablets, butstill below the third-generation iPad’s display of 2,048 by 1,536pixels. The only comparable resolution in Android land would be theAsusTransformer TF700T, which sports a resolution of 1,900 by1,200 pixels. 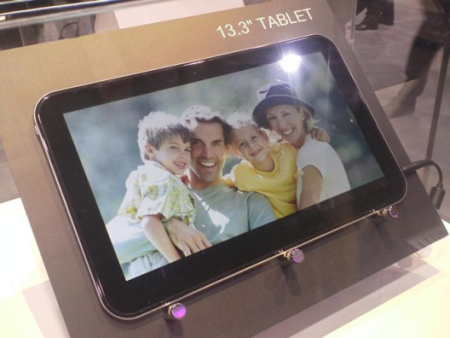 Toshiba’s new 13-inch tablet aspreviewed at January’s CES 2012. Make no mistake though, the 13-inch model is big: it weighs2.2 pounds, it’s 0.4 inches thick and is practically the size of aserving tray. But with the size, you get a range of ports, including afull-size SD card slot, a microUSB port and a microHDMI port. Toshibaalso claims the battery can last up to 13 hours, and there’s anincluded (separate) tablet stand for when the tablet gets too heavy forusers. The giant Toshiba tablet also packs some powerful specs inside: it runsAndroid4.0 Ice Cream Sandwich on a NvidiaTegra 3 quad-coreprocessor and 1GB of RAM, and sports dual cameras, 1.3-megapixel on thefront and a 5-megapixel on the back. There’s no 3G/4G connectivity onboard though, and the Excite 13 is set to arrive on June 10 for $650for the 32GB model and $750 for the 64GB model — around $50 more thanthe equivalent iPad models. With a 13.3-inch tablet, almost double the size of the popularAmazonKindle Fire, Toshiba hopes toappeal to those who use theirtablet mostly at home. With the large screen and loud SRS Surroundspeakers, it’s easier on the eye to watch videos (as long as you usethe aforementioned stand), and it could be better for video calls aswell. But if you’re looking for some more regular-sized tablets fromToshiba, the company also introduced 7.7- and 10-inch Excite tablets,also running on quad-core processors and Android 4.0. The Excite 10 isset to go on sale in May for $450 for 16GB, $530 for 32GB or $650 forthe 64GB model. The Excite 7.7 will arrive in June with the Excite 13,at $500 for 16GB and $580 for 32GB.